In lieu of our weekly new releases post (Summers are kind of slow! Who knew? 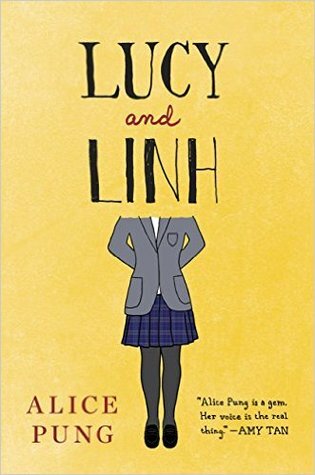 Apparently, everyone but me…), I’m taking this opportunity to talk about one of my all-time favorite books: Lucy and Linh by Alice Pung. Anyone who knows me has heard me talk about this book again and again and again — and for good reason. Lucy and Linh (also known by its other title, Laurinda) centers on Lucy, a daughter from an Asian immigrant family, who struggles to balance her life as a scholarship student at Laurinda, a cutthroat all-girls private school for the elite, with her life at home with her working class family. It’s a story about immigration, family, racism, and identity — all things that are incredibly important to me, as a Taiwanese American daughter of immigrants. “What part of China are you from?” Aaron asked me, in the way you would ask a four-year-old to hold up a handful of fingers to show their age. “Well, my mum went into labor and I popped out.” There was an awkward silence; my joke was hanging there like a tightrope walker without a net. Linh, you would have retorted with “What’s a white guy like you doing being born in an Aboriginal country?” but I didn’t. When #FamiliesBelongTogether was gaining traction a month ago, a post went up on Rich in Color by K. Imani about empathy for immigrants, with an accompanying book list (read it here!) — and it got me thinking about the books that served as either a mirror or a window to my own identity as a child of immigrants. The toxic narrative behind anti-immigrant sentiment is a dehumanizing one, one that simplifies and twists reality into something that can justify cruelty. Books like Lucy and Linh and many others help push back against this kind of narrative. At the same time, reading isn’t enough. With ICE deporting immigrants and the Muslim Ban upheld by the Supreme Court and — well, the list goes on, unfortunately, there’s always something that can be done to push back. Support immigrant authors writing their stories. Tell your elected officials that you care about immigrants and want them to fight back against racism. Donate to organizations working to help immigrants (here’s a handy link to donate, via Kid Lit Says No Kids in Cages). So: What are you reading? And what are you doing?